Promo - Doctor Who 5.04 "The Time of Angels"
If you’re in the UK, you’ve probably just seen “Victory of the Daleks,” the third episode of the fifth (or thirty-first) series of Doctor Who. However, you’re probably more excited about the trailer that came after the episode itself. Not because the episode wasn’t great, but because the trailer for the next episode looks even better. “The Time of Angels,” the series is called, and it looks like it’ll be one of the scarier episodes of the show, primarily because of the inherently creepy Weeping Angels. 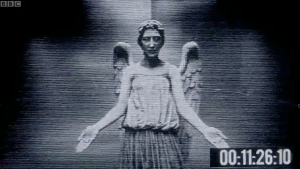 What are the Weeping Angels? Well, they look like statues, but they’re anything but. These “angels” are actually aliens who have a built-in defense mechanism — if they come into anyone’s vision, they are transfixed into stone. But when those people look away, the angels move incredibly quickly to grab you. Their touch sends you back in time, and the angels feed off the residual energy of the life you would have had. “They’re the only psychopaths in the universe to kill you nicely,” the Tenth Doctor (David Tennant) said of them in “Blink,” the only other Who serial in which they have appeared. Along with the Weeping Angels, River Song will be returning. We first saw her in the two-part episode “Silence in the Library/Forest of the Dead,” in which she died to save the Doctor from the Vashta Nerada. River Song’s exact relationship is unknown, but she revealed to the Tenth Doctor that she was close to one of his future incarnations. That future incarnation is obviously Matt Smith’s Eleventh Doctor, who will give her his green sonic screwdriver at some point. “The Time of Angels” will be the first of a two-part serial, with episode 5.05, “Flesh and Stone,” as the second part. Check out the BBC One promo below. And don’t blink.